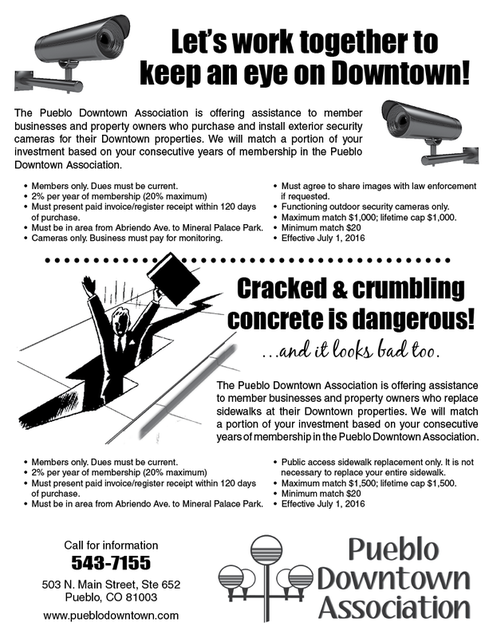 The Pueblo Downtown Association is proud to offer our members these special member benefits. If you are a PDA member concerned about security in your area and would like to install or expand your security camera system, we can help. winners at our monthly meetings, for contest winners, etc. shoppers and diners to your retail store or restaurant. There is no cost to member businesses to participate in this promotion. ​back of the "dollars," please accept them as payment for purchases. We will reimburse you for the face value of the certificate. Offer the discount card to your employees and customers. Call the office, 543-7155, for details on how you can benefit from this great promotional program. Support Pueblo Downtown Association & save money too! Springside Cheese Shop 517 W. 5th St.
My Friend the Printer 410 W. 5th St.
Convention Center. In addition to Pueblo Downtown Association materials, we allot a space (34" wide X 45" deep X 50" high) to a member business. The display is changed on a bi-monthly schedule with the next member business replacing the outgoing ​exhibitor. If you would like to get on our reserve list, contact Margaret@pueblodowntown.com or call 543-7155.